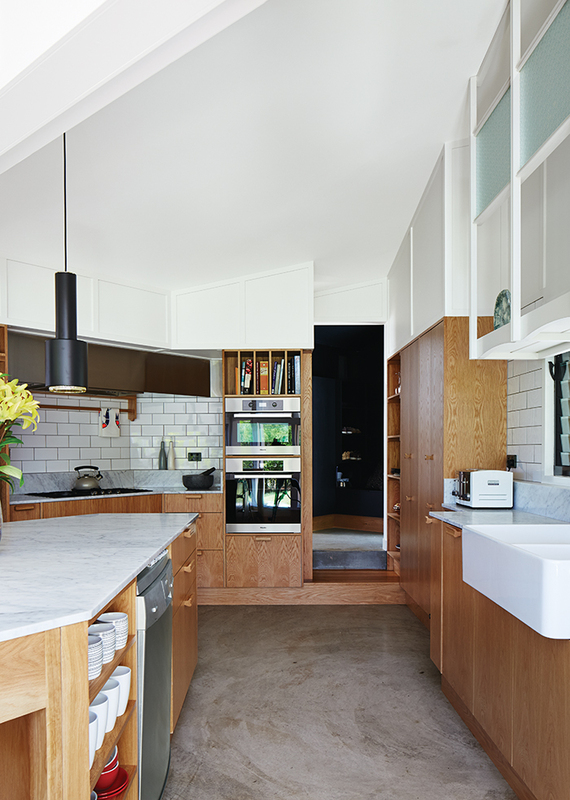 Brisbane-based studio Owen and Vokes and Peters designed a modern kitchen addition for a traditional Queensland-style timber house. Glossy Vogue Ghiaccio kitchen tiles set off custom cabinetry built by Cooroy Joinery & Woodworks using American oak veneer and Centor doors. The dishwasher is by AEG. The kitchen addition is clad in James Hardie fiber-cement board. 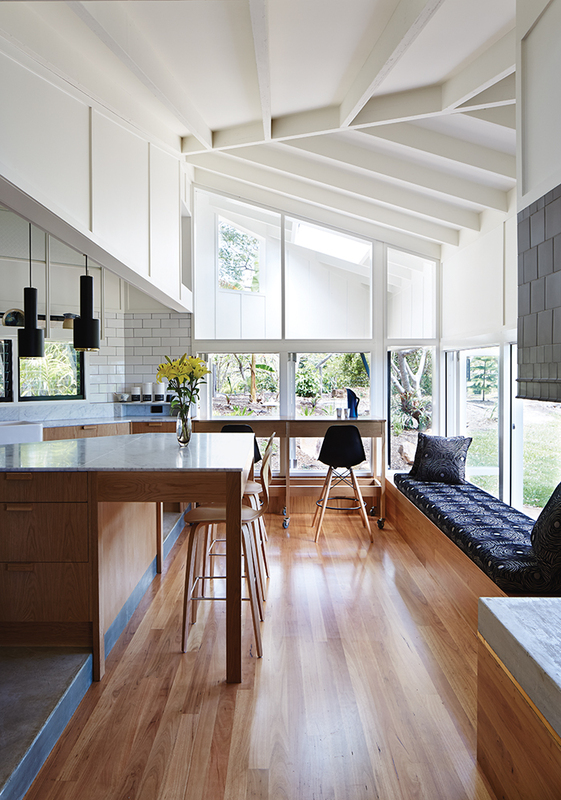 The architects used blackbutt wood for the flooring and Whisper White paint by Dulux throughout the interior. An A110 Hand Grenade Pendant Lamp, by Alvar Aalto for Artek, hangs above the white Carrara marble-topped island. 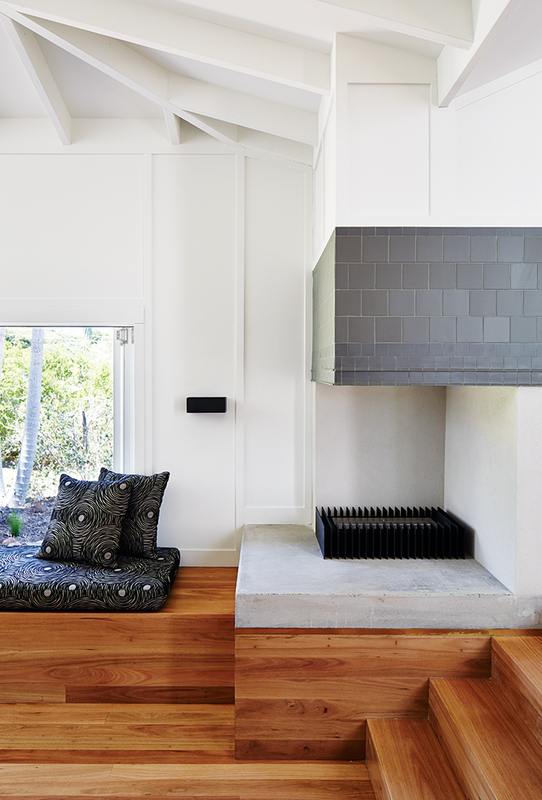 In the living area, an EcoSmart Fire ethanol-fueled fireplace is lined in charcoal tile by Winckelmans; the bench cushion is upholstered in Gillespie Onyx from Warwick Fabrics. 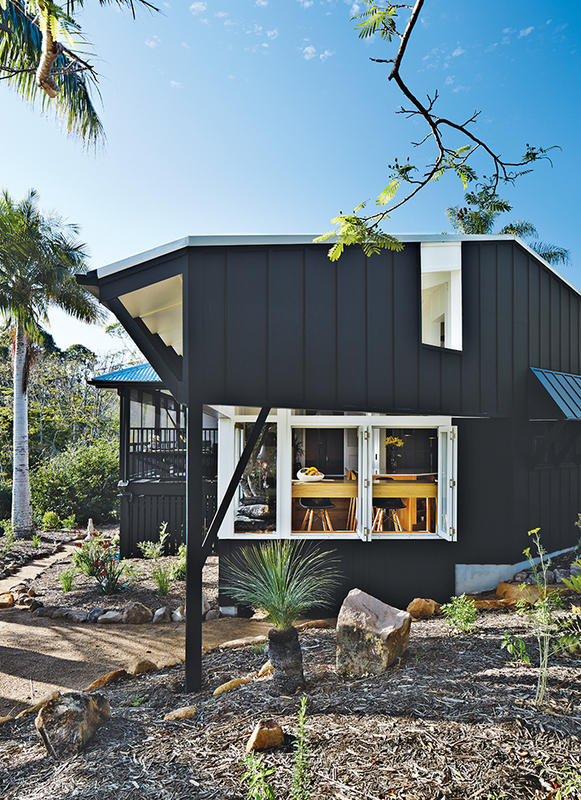 When Australian architects Paul Owen, Stuart Vokes, and Aaron Peters were hired to update a timber mountain house on the Sunshine Coast, outside of Brisbane, they went small and modern—a complement to the region’s Queensland vernacular style. They installed a new triangular kitchen extension, measuring only 376 square feet, to clarify the entry to the house and create space for informal gatherings. The owners, a semiretired couple who intend to make the house their full-time residence, see the kitchen addition as a crucial social element where their extended family can convene to read the newspaper or sidle up for a chat while someone is preparing dinner. Enhancing the intimacy and warmth of the kitchen is an adjacent stair-stepped lounge area that looks out onto the surrounding landscape. The architects created select apertures to the outside world with the careful placement of eaves, taking the focus off the broad, sweeping vistas and shifting the view onto certain moments in the garden and the odd glimpse of foliage. American oak–veneer cabinetry, Carrara marble bench tops, and a custom surround for an EcoSmart fireplace contribute to the cozy interior.